County Executive Marc Elrich hosts the first of six 4Business listening sessions, Ride On gears up for the annual Give and Ride food collection campaign, Greenfest will be celebrated at Brookside Gardens, the County’s Department of Correction and Rehabilitation is hiring, Drug Take Back Day will take place at the end of the month and the County’s Animal Services and Adoption Center hosts rabies vaccination clinics. County Executive Marc Elrich and Councilmembers grant a Child Abuse Prevention Month Proclamation, Department of Environmental Protection Director Adam Ortiz kicks off Earth Month, a final farewell celebration is given to retiring Police Chief Tom Manger, some MCPS middle schoolers win a national documentary production competition, Montgomery College’s Germantown Campus celebrates its 40th anniversary, the Department of Correction and Rehabilitation is recruiting and the Wings of Fancy display returns to Brookside Gardens. Council considers a bill aiming at law enforcement trust and transparency, the State of Maryland hosts public workshops to inform county residents about I-495 and I-270 extensions, the Department of Health and Human Services launches a 24/7 homeless hotline, some MCPS students celebrate World Water Day, the Marilyn Praisner Library will close for six months due to a remodeling project, the Rockville Arts Festival returns to the Town Square and Brookside Gardens celebrates the arrival of spring. County Executive Marc Elrich unveils his Fiscal Year 2020 Recommended Operating Budget, County Council reacts to the County Executive’s Proposed Budget, Executive Elrich takes to the airwaves on the County’s Spanish language radio show, we take you to a community dialogue on Racial Equity and Social Justice, 2020 Census is hiring in the county, the City of Rockville has a program that gives free bikes to children, and the County’s Chamber of Commerce celebrates outstanding acts of valor by public safety personnel. County Executive Marc Elrich announces a new Early Care and Education Initiative; Executive Elrich and Council President Nancy Navarro host a Racial Equity and Social Justice forum in Silver Spring; the County’s Department of Transportation has started pothole repairs; the office of Community Use of Public Facility promotes its rental opportunities at public spaces; this is Carbon Monoxide Awareness Month; MVA extends hours; and Cherry Blossom Peak is around the corner. County Council will consider legislation to eliminate gender pay discrepancies in county government; the Department of Health and Human Services offers a Free Tax Preparation Service for county residents; the Department of Transportation announces the expansion of the e-bike program; the Office of Human Rights organizes the annual civil rights tour; the City of Rockville seeks residents’ input about the city’s boards and commissions; and Montgomery County Public Schools hosts a student town hall at a local high school. Members of the Metro Board meet with county residents to highlight Metro train improvements, the Office of Consumer Protection gets ready to celebrate consumer protection week at county libraries, the 2019 regional early childhood education summit took place at Montgomery College, Carderock Springs Elementary School students participate in a community project to combat hunger, the City of Rockville goes Purple in the fight against opioid addition, and the County’s Fire and Rescue Services gets a new K9. We sit down with County Executive Marc Elrich to tape our monthly show “One on One”, Councilmember Tom Hucker proposes legislation to attack lead in school drinking water, Council President Nancy Navarro addresses pedestrian safety, the Office of Human Rights gets ready for the annual Civil Rights Tour, the Office of Consumer Protection celebrates consumer protection week with event at county libraries, and Parkland Middle School seventh graders participate in a space experiment. Montgomery County launches its “Everyone Counts in Montgomery” outreach campaign for the United States Census 2020, Marriott International shares its human trafficking prevention training, the Department of Transportation conducts an audit of all bus stops to decide on engineering improvements, the Volunteer Center is seeking nominations for its annual Montgomery Serves Awards, Library Lovers Months is celebrated throughout the county’s library branches, and the VITA program is helping county residents file their federal and state taxes for free. Montgomery County Police Chief Thomas Manger is retiring in April; Nancy Navarro talks about early education; a new VA community clinic opens in Gaithersburg for veterans; Rainbow Place provides a warm shelter for women in need. Executive Marc Elrich continues hosting FY20 Operating Budget Forums throughout the county; County officials and nonprofit organizations join efforts to assist furloughed federal employees; the Department of Housing and Community Affairs is getting ready to publish a list of troubled rental properties; MCPS Superintendent Dr. Jack Smith announces his proposed budget; the county’s Department of Health and Human Services gears offers free Naloxone training to interested residents; Rockville joins the fight against opioid abuse with an educational campaign; and we take you to the “Day of Service” honoring Dr. Martin Luther King, Jr.
Executive Marc Elrich kicks hosts the first of five FY20 Operating Budget at the Silver Spring Civic Center; the Department of Housing and Community Affairs gears up to inspect every one of the 1,119 units at the Enclave apartment complex in Silver Spring; Executive Elrich hosts a media round table with members of the local media; the county’s Department of Health and Human Services offers free Naloxone training to interested residents; Rockville joins the fight against opioid abuse with an educational campaign; and the Department of Recreation will host a Summer Camp Fair on January 26th. Executive Marc Elrich kicks off the year hosting five FY20 Budget Forums throughout the county; the county’s Department of Health and Human Services gears up to offer free Naloxone training to interested residents; Ride One makes some route schedule changes and route expansions; the county also prepares to honor the memory of Dr. Martin Luther King, Jr. with a day of service and celebration at Strathmore Music Center; and the Department of Recreation will be hosting its third annual Comic Convention and also a Summer Camp Fair. A journey back through some of the stories that defined 2018. Lorna Virgili hosts “Cápsula Informativa del Condado de Montgomery”, a Spanish language informative show. On this show: Good news for Metro users, the Red Line will no longer have a turnaround of trains during rush hours; Executive Marc Elrich talks about his first few days in office and the FY20 Operating Budget preparations; the county gets ready for the Dr. Martin Luther King, Jr. commemoration and day of service; the Department of Health and Human Services offers free Naloxone training; Executive Elrich takes to the airwaves on the County’s Spanish language radio show; and the Stanley Cup travels from DC to Gaithersburg to pay a visit to some high school students. Lorna Virgili hosts “Cápsula Informativa del Condado de Montgomery”, a Spanish language informative show. On this show: County Executive Marc Elrich asks departments to identify savings of 1.5 percent from the current FY19 budgets; US Senator Ben Cardin meets with councilmembers; Executive Elrich continues his listening sessions throughout the county; the Minority Legislative Breakfast gathered local, state and federal officials; one councilmember highlights potential pedestrian safety issues in Bethesda; we take you to the MCPS Educational Foundation Gala and the Gardens of Lights at Brookside Gardens is open until January 1st, 2019. Lorna Virgili hosts “Cápsula Informativa del Condado de Montgomery”, a Spanish language informative show. On this show: March Elrich becomes Montgomery County’s 7th County Executive; we take you to the inauguration of Executive Elrich and the 19th County Council; Local, State and Federal officials gather at the Executive’s Ball; County Council elects its leadership for 2019; ACA enrollment is coming to a close; on the county’s Spanish language radio show we talk about the executive’s vision about businesses in the county; and we take you to a night market at the Crossroads. County Executive Ike Leggett gets a farewell on “Montgomery al Día”, the county’s Spanish language radio show; county officials tour the construction site of the upcoming new government building in downtown Wheaton; County Executive-Elect Marc Elrich hosts listening sessions throughout the county; the Police Department receives a generous donation of teddy bears for the family justice center; open enrollment for ACA comes to an end on December 15th and county clinics are helping residents complete the applications; and the 19th annual MCPS Latin Dance Competition took to the stage at Strathmore Music Center. Anqoinette Crosby hosts County Report This Week. On this episode: The county works with the Street Smart program to keep pedestrians and cyclists safe; Rockville councilmember resigns; holiday cooking fire safety tips; the county kicks off its “Gift Outside the Box” eco-friendly campaign; MCPS students attend the Maryland Stem Festival; Small Business Saturday is November 24; and the Garden of Lights is on display at Brookside Gardens thru Jan. 1, 2019. Lorna Virgili hosts “Cápsula Informativa del Condado de Montgomery”, a Spanish language informative show. On this show: 55% of registered voters in Montgomery County casted ballots during the general election; we tape the final episode of One on One with County Executive Ike Leggett; officials participate in the beginning of the Clarksburg sewer extension; 4th graders at Olney elementary school build three rain gardens; City of Rockville starts its FY20 budget public hearings; Planning Department hosts a walking tour of the Aspen Hill area to address pedestrian safety; the Thanksgiving Parade will be held on November 17th in downtown Silver Spring; and the Garden of Lights at Brookside Gardens celebrates its 20th anniversary. Lorna Virgili hosts “Cápsula Informativa del Condado de Montgomery”, a Spanish language informative show. On this show: Construction of the first Bus Rapid Transit route along US Route 29 has started; Maryland Governor Larry Hogan joins Executive Ike Leggett for the groundbreaking of the new Avery Road Treatment Center; the Department of Transportation begins leaf collection in the designated districts; Executive Leggett attends his last Snow Summit; the Thanksgiving Parade is around the corner and Brookside Gardens will celebrate the 20th anniversary of the Gardens of Lights . These stories, plus what took place in the County’s Spanish language radio show “Montgomery al Día”. Lorna Virgili hosts “Cápsula Informativa del Condado de Montgomery”, a Spanish language informative show. On this show: Executive Ike Leggett announces the official activation of two advanced microgrids at the Public Safety Headquarters and the Correctional Facility; Early voting is here and there are 11 voting centers throughout the county; we take you to a Broadband Summit; MCPS 7th graders will now have the opportunity to learn about finances within their educational curriculum; the World of Montgomery Festival was a total success, as thousands attend; we give you some Halloween safety tips and Manna Food Center seals events during a food recovery week with a Chefs Cooking Competition. These stories, plus what took place in the County’s Spanish language radio show “Montgomery al Día”. Lorna Virgili hosts “Cápsula Informativa del Condado de Montgomery”, a Spanish language informative show. On this show: the Board of Election is seeking for bilingual election polls volunteers; MCPD hosts its annual Drug Take Back Day; County Council hosts a Youth Town Hall Meeting; Community Service Week will take place from Oct. 21-28; Thomas Edison High School opens doors to its new installation; Montgomery College celebrates International Peace Day with a full day of soccer games; and the County’s Animal Services and Adoption Center waives adoption fees for one day. Lorna Virgili hosts “Cápsula Informativa del Condado de Montgomery”, a Spanish language informative show. On this show: County Council approves a measure to help local breweries and wineries increase their incomes; Montgomery County Public Schools participate in Walk to School Day activities; County Executive Ike Leggett cuts the ribbon of his fourth and final opening of a newly remodeled community recreation center; City of Rockville announces its new City Clerk; Hispanic Heritage Month is celebrated with a career fair at Blair High School; County Council will host its 8th Annual Youth Town Hall Meeting; and the World of Montgomery Festival takes place at Montgomery College on October 21 . These stories, plus what took place in the County’s Spanish language radio show “Montgomery al Día”. Lorna Virgili hosts “Cápsula Informativa del Condado de Montgomery”, a Spanish language informative show. On this show: Voting Registration Deadline is coming up on October 16th; Planning Department hosts a Pedestrian Safety meeting at the Aspen Hill Library; County officials participate in the groundbreaking of ARTSPACE in Silver Spring; Montgomery College hosts a statewide cyber security competition; Maryland State Officials tour Pike and Rose and Bethesda; County Council hosts a 5G Cell Antennas Hearing; City of Rockville celebrates Fire Prevention Week; and GlaxoSmithKlein staff visit a local high school to encourage students interested in biochemestry. 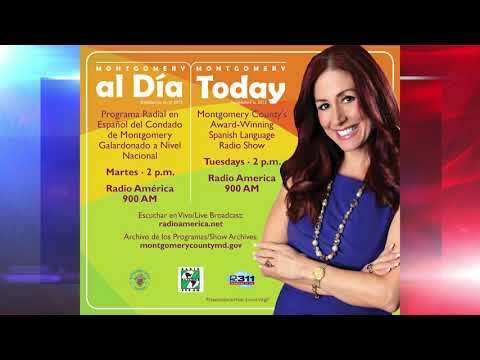 These stories, plus what took place in the County’s Spanish language radio show “Montgomery al Día”. Lorna Virgili hosts “Cápsula Informativa del Condado de Montgomery”, a Spanish language informative show. On this show: : Police and the Department of Liquor Control relaunch the “We Take it Personally” DUI Enforcement Campaign; the Office of Procurement hosts the Third Annual Procurement Forum; an educational and outreach pedestrian safety campaign is launched in Wheaton; Executive Ike Leggett and his wife Catherine are honored at Strathmore; City of Rockville Mayor delivers the State of the City Address; Glenstone Museum opens new art pavilions; the Taste of Bethesda is just around the corner; and the Wheaton Arts Parade defies the rain. These stories, plus what took place in the County’s Spanish language radio show “Montgomery al Día”. Lorna Virgili hosts “Cápsula Informativa del Condado de Montgomery”, a Spanish language informative show. New affordable senior housing opens in Silver Spring; a new veterans clinic opens in Gaithersburg; the Leggett Legacy Forward event will be held on Sept. 23 to help send underrepresented students to college; a graffiti artist is transforming public spaces in Montgomery County; and the county hosts the free Friendship Picnic on Sept. 23 at Wheaton Regional Park. Lorna Virgili hosts “Cápsula Informativa del Condado de Montgomery”, a Spanish language informative show. On this show: Over 163,000 MCPS students return to the classrooms; Montgomery County Public Schools announces new security measures for the 2018-2019 school year; the City of Rockville welcomes a new CPDS Director; the Board of Election is in need of election workers for the general election; the Friendship Picnic will take place at Wheaton Regional Park; and Montgomery College’s volleyball team gets ready for the season.nal Park. Capsula Informativa del Condado de Montgomery helps raise awareness among Spanish speaking Montgomery County residents of recent activity with the County. Program airs on Comcast ch 6, 996 (HD), RCN ch 6, 1056 (HD), and Verizon ch 30 at the following times: Sun - (2:45pm) | Mon - (12:45am, 12:45pm) | Tues - (11:30am, 10:45pm) | Wed - (12:45am, 9:45am, 9:45pm) Thurs - (10:15pm) | Fri - (2:00pm) | Sat - (11:30am).